Australia's middleweight champion Robert Whittaker has joined UFC boss Dana White in heaping praise on the performance of his next challenger, Israel Adesanya, but says the Nigerian-born Kiwi is "hittable". With Whittaker recovering from a recent operation, Adesanya claimed the interim title with a unanimous points win over American Kelvin Gastelum in Atlanta, Georgia, on Sunday AEST. Gastelum was meant to fight Whittaker in Melbourne in February but the champion was rushed to hospital for abdominal surgery on the morning of the scheduled bout. Instead the American slugged it out in an epic five-round contest with Adesanya. White was hugely impressed with what he saw from Adesanya. "You know who he reminds me of? Conor McGregor," White said in a press conference. "Conor came in, he stayed active, he built up a lot of notoriety, he had some great fights and people knew his name and people wanted to see him fight. 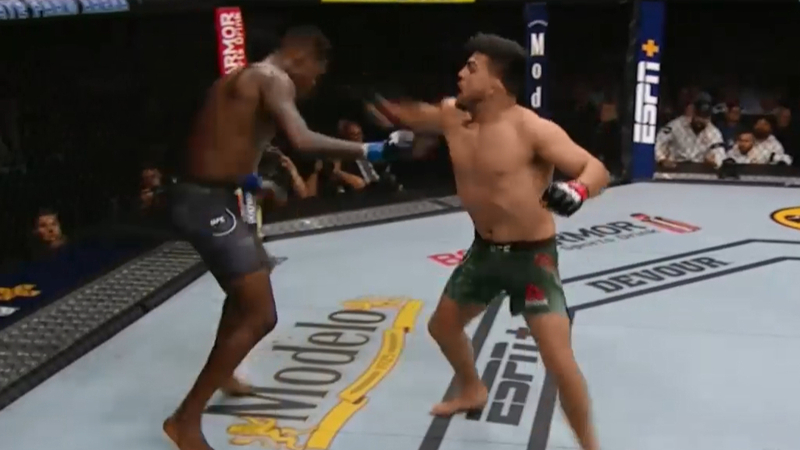 Israel Adesanya is on that same trajectory right now. He's doing the same exact thing Conor did. "And do you know what Israel doesn't say when we call him? He doesn't say, 'No. I'm on vacation. I'm not going to show up and fight for a belt and then possibly get a shot at the champion and make pay-per-view money.' He says, 'Yeh, I'll see you in Atlanta'. "And when you have that type of confidence in yourself it pays off and it's definitely going to pay off for him." After the fight, Adesanaya came out swinging at Whittaker, who he called "fake Aussie" as the two are set for a much-anticipated showdown. "New Zealand, this is where this strap belongs, and then taking it back to Nigeria as well.," Adesanaya said. "Australia has already got some Aussie, some f---ing fake Aussie parading with one of these. I don't think he even has one of these. "He's on that old system. We're on that new flex. "So yeh, we're taking this back to New Zealand ." Whittaker said he would be happy to fight Adesanya in August provided the confident New Zealander recovered well from his torrid fight. "He showed a lot of heart. He got hit a little bit and came back," said Whittaker. "He was very accurate, with high volume. It was a very impressive win." Whittaker believed Adesanya's style presented opportunities he could exploit however. "I'm better at striking (than Gastelum). I'm going to punch him and I am very, very good at it, very fast and hit hard and he doesn't like getting hit." Whittaker said a bout between Abesanya and himself would be one of the biggest combat sports events ever held in Australasia, and many in the MMA community agree. A venue has still be to determined but Whittaker said he would welcome fighting in Australia, despite injury forcing him out of his last two scheduled fights on home soil.